My darling sweet hubby changed his oil on Friday morning before we headed out of town for the night. Unfortunately, we ended up with a big oil spill in our driveway. He sopped up the oil with some towels and then threwthem in our washing machine. Oops. Let's just say, lesson learned. Never again will an oil soaked towel or two grace the presence of our washing machine. It was a nightmare. The smell was bad, but the residue left behind was awful! So, when we got back into town on Saturday, with multiple loads of laundry waiting on me, I had a hot date planned. A hot date with my washing machine! It was just me, my washing machine, some vinegar, bleach, and dish detergent! I used this tutorial from Somewhat Simple. It took a few hours and a lot of water, but my washing machine is in much better shape! Honestly, I couldn't have washed another load of diapers or clothes without having done this task. I'd like to add that I have an older non-HE top loader. Nothing fancy. While I'd love a new washing machine, the idea scares me. My wash routine for my diapers works great and I don't want to switch up any part of the equation right now. 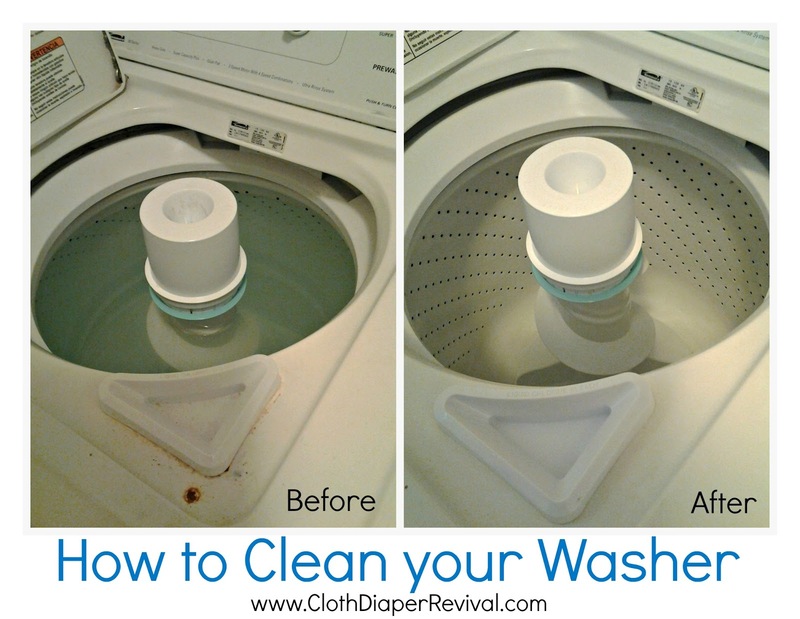 If you've never cleaned your washing machine, you really should. All that left over residue from dirt, detergents, oils, etc. is getting left behind on the walls of your machine and rubbing against your clothes and diapers. Have you ever taken on this task? How often do you clean your machine? Uhh.. I know the feeling. My husband is a mechanic and when he comes home he forgets to take the shop rags out of his pockets before throwing his work clothes in the washer. Not to mention his work uniforms are supposed to be laundered by a professional laundry service his works provides. :?? ?/ GRR! I've run a load with 2 cups of bleach a couple of times. I got my washer used on Craig's list in December and I really need to give it a good cleaning! The bleach run helps but it needs a deeper clean for sure.